Vision Projects have recently secured a furniture order with Leicestershire based construction giants Caterpillar to supply new Herman Miller sense desks to all staff. Vision tendered for the project against a host of furniture specialist but came out on top due to the quality of the proposed product and the strong working relationship between the Vision team and the client. The work is planned over a series of phases that will see the office staff grown to match the increased demand for the Caterpillar products. The first phase which is due for completion this year and worth £250,000.00 sees the installation of 174 Sense desks with a stack of three high Meridian units acting as both storage, partition and worktop. This system was chosen for its stylish design but also its functional applications. 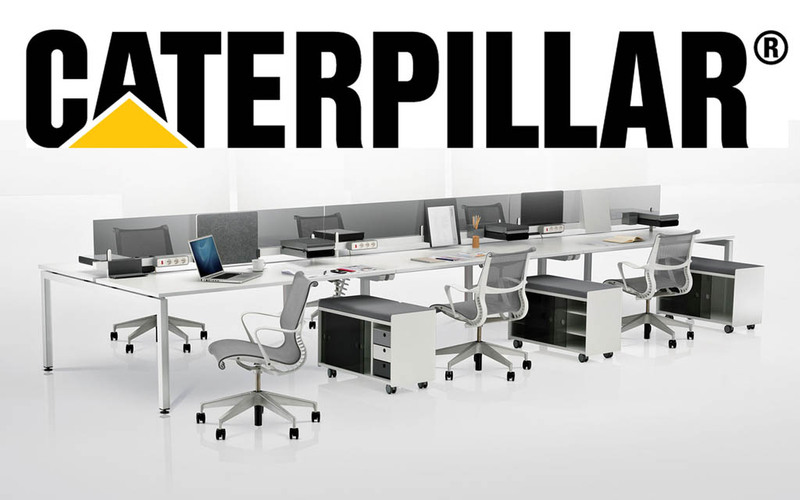 The desking will complement the new Orangebox DO task chairs that were supplied to Caterpillar by Vision Projects last year. The space plan for this office has gone through several stages of development with the team at Caterpillar intent on selecting a layout and furniture system that suited their existing style of work while creating a fresh and modern working environment. With help from the Vision design team a space plan was drafted and a design settled upon that fulfilled the clients brief. Following a visit to the Herman Miller showroom in London with the Vision sales staff the Sense system was agreed upon due to its flexible assembly and stylish aesthetics. The first phase also sees structural changes to the proposed office which include the construction of meeting rooms and the refurbishment of existing kitchen and toilets. Works on the subsequent 3 phases are planned for next year, each phase a similar size to this project.